When I was a little girl, my parents had good friends who had a very pretty daughter. Carolyn was about nine years older than me, and so very mysterious. My sisters were a little older than me, but there was no mystery there – they were just slightly more obnoxious versions of me. And they did disgusting things, like blow their nose, and poop. I was sure Carolyn did not. She was stylish and quiet, and for the most part, she completely ignored me. And so I adored her (from afar). But I remember one summer day. I must have been about nine, and so Carolyn was probably eighteen. Our families were at a local lake having a picnic, and we needed something – ketchup or relish or something – and Carolyn volunteered to make a run to the grocery store. And she took some of us kids with her. Holy cow. That was so cool. Carolyn wore sunglasses and she had a little headscarf to keep her hair in place, with her curly ponytail sticking out the back of the kerchief, blowing in the breeze. She was the most beautiful girl in the world. And not only that: In her convertible, she was just like my idol – Nancy Drew. I had a dozen Nancy Drew books which my sisters had outgrown. “The Hidden Staircase” was my favorite. Nancy was smart and independent, and pretty. Her father let her go all over the world – by herself. She had adventures. She had a boyfriend. And she had a little blue convertible. That’s who I wanted to be. My name was Nancy too. The Bobbsey Twins had a Nan, but she was such a wuss. I wanted to be Nancy Drew in my little blue roadster. But somewhere in high school or college or graduate school or working for the last forty years, I forgot. And here I am. Sixty-one and getting ready to retire while at the same time trying desperately and pathetically to look as young as possible. For the last nine months we have needed to replace my husband’s beat-up SUV. We looked at a lot of semi-beat-up SUVs. Nothing excited us. But we continued to look. And last month on the way to the grocery store, I saw a car, and a memory jolted me. I had a revelation. A youthful revelation. And after nine months of searching unenthusiastically a dull car, it took us two weeks to find a bright blue convertible. I feel just like Carolyn/Nancy Drew. I’m eighteen again, and I’m driving my little roadster. The breeze is whipping my sixty-one-year-old hair. My friend Debra bought a convertible when she reached a “certain age”. And my step grandmother had one into her 90’s. It seems to be the case that men of that age buy motorcycles and women buy convertibles. Yeah, he wants a motorcycle. But I’m not letting him. Why not go for it?! That’s wonderful, outrageous and fabulous.I agree with you. Why the heck NOT? You only come this way once . . . I think you made a happy choice. My son-in-law’s grandmother bought a white convertible with red interior when she was seventy. Yahoo! A convertible is a fun way to see the world. Enjoy your new ride! I’ve got the sunglasses, but I’m still searching for ways to wear a scarf without looking like my grandmother in her babushka. Not you – you’ll look just like Grace Kelly in her little convertible – go, Nancy, go! Oh, how fun! My neighbor has been zipping around town in her little Mazda Miata for years, starting sometime in her 60’s (and she’s way past 70 now). She’s not stopping any time soon. Enjoy it! Oh, I loved Nancy Drew as well. I lived for the next book, saving all of my money so I would be able to buy it right when it came into the store. I think that they cost 99cents, and then went up to $1.25. The blue convertible….we had one that I drove as a teen. My dad loved his little Dodge Dart, but I got it when he moved on to another car. I was the primary driver of all my friends for most of my high school years. My parents had a Volkswagon convertible. I don’t know the model of it because I never know that, but boy did I love driving that thing. You should also start solving some crimes like see if there actually is a secret in that old clock. My secret ambition is to solve a famous unsolved crime. For instance, I want to find out who really killed Lizzie Borden’s parents. Oh, Nancy, what a great story, and now here you are flying along with the wind in your hair! Life is good! Keep enjoying it like that and don’t worry about the scarf. Scarves are “in”! Just don’t tie it in a little knot under your chin. I love this post. I had forgotten about my love of Nancy Drew. She was always so pulled together and clever. The book pictured was my first one as well. I remember that my favorite aunt, Debbie got it for me for my birthday when I was about 9 and I knew she had seen right into who I really was. I was hooked on Nancy and every other mystery book since then. Thanks for the reminder and I hope you enjoy every day of your pretty blue convertible. Be blessed! Good for you! I had a convertible a few years ago. I could never put the top down, though, because I had too much junk on the back seat, and something was always blowing out…. And I also loved Nancy Drew books! I’m so jealous! What a great idea! I am going to live vicariously through you, my new Nancy Drew! Good for you. You can also model yourself on Audrey Hepburn and Ingrid Bergman — both beautiful scarf wearers. I loved that book! (Although I thought the Hardy Boys were smarted and had better cases). Watch the long scarves in the convertibles….don’t want to end up like Isadora Duncan! I was more an Encylopedia Brown girl but I loved the Nancy Drew of the TV series. Great, now I want a convertible too. That was my favorite book of the series. I tried so hard to get my daughter to love Nancy Drew but it was hard to compete with the Potter boy. Enjoy every ride in it! My co-worker read my blog yesterday, and right afterwards, happened upon a Nancy Drew book at a tag sale. She bought it for me! “The Bungalow Mystery” – I can’t wait to read this again! 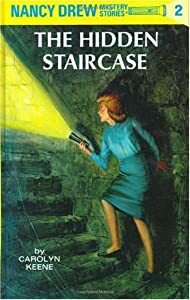 The Hidden Staircase was and still is my favorite Nancy Drew book. I still have mine and I think they’re overdue for a re-reading. Congratulations on your little blue roadster! I’ve wanted one for years, but always go for practical. Now you’ve got me thinking. I’m retiring and moving across the country in a couple of months. Maybe it’s time to let myself live my roadster dream, too! I hope you go for it! I can’t believe how much fun it is! What fun! I loved Nancy Drew, too. I remember in one book she had to map out the creaks on a staircase so that she could sneak up them without making a sound. I thought about that scene every time I sneaked down to the kitchen to steal cookies. I bet you are rocking’ in your new car!